It has come to the attention of local architectural preservationists that the new owners of the Kruidenier House (3409 Southern Hills Drive) have been in contact with the City regarding plans to demolish the house. They have also been in contact with the State Historical Society of Iowa regarding their plans. There is little that anyone can do other than persuade them that the significant architectural heritage of this house makes it worth rehabilitating. The house generally sits on the east side of a hill. The western wing (bedroom wing) of the main house is built on a concrete slab. The main living spaces east of the central atrium is built over the walkout basement. The guest quarters addition is located southeast of the main house and connected via an outdoor corridor. The interior of the main portion of the house was gutted by the previous owner. Interior elements that remain are the atrium, fire places and some tile flooring. The guest quarters wing is generally intact. The owners stated they first considered rehabbing the property but the challenges identified by the architects and contractors they have talked to lead them to decide it was cost prohibitive. Here are some of the overarching items they mentioned during a meeting with City staff. Lack of crawl space below bedroom wing. Water issues caused or associated with the atrium that would require its excavations in order to determine if/how they could be fixed. Other typical renovation expenses including insulation, window work, wiring, plumbing, water line, etc. They plan on keeping the driveway and trees. A separate temporary construction road would be built for equipment. This is very sad news given the architectural and historic significance of the house. It would be a major loss to the City of Des Moines to lose this building. If the new owners move forward with demolition without an opportunity for the public to be made aware, to comment, and to persuade them to consider alternatives, the results will be loss of an irreplaceable part of our city’s architectural heritage. The Southern Hills area is full of significant mid-century modern architecture that will need major rehabilitation in the coming years as it ages. Southern Hills was Des Moines first Planned Unit Development, and the Kruidenier House was the first one built in the neighborhood followed by the Harold and Kate Goldman House designed by Richard Neutra next door to the west. David Kruidenier designed the house in partnership with a local architect and friend. 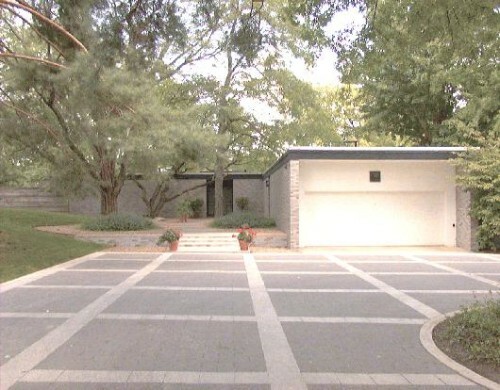 David acquired the same brick for the exterior as was used on the Museum of Modern Art in New York City. The front double doors were designed by Eliel Saarinen. They were the doors to a small theater in the Des Moines Art Center, that has been repurposed as gallery space. Chic Herbert designed the wood privacy fence to the west of the main entry. Sasaki Associates devised the landscape plan including the Sumi Crab allee that parallels the long drive, planted in a forced perspective to make it appear even longer. Regarding the Kruidenier family, David and Elizabeth Kruidenier and their families made numerous significant contributions to the City of Des Moines. Indeed, it is nearly impossible to point out architectural or cultural points of interest without referencing the Kruidenier’s involvement, financial support and leadership. Representatives of the State Historical Society of Iowa recently toured the house and informed the new owners of historic preservation incentives that may be available to offset rehabilitation costs for the house including state tax credits. The house is likely eligible for listing in the National Register of Historic Places (NRHP) under two, if not three, of the criteria for both it’s architectural and historic significance. The home may also be a candidate for consideration to designate as a City of Des Moines Local Landmark.